Returning from exhibiting at the CES trade show in Las Vegas, which took place Thursday, January 8th â€“ Sunday, January 11th, 2009, it was noticeably lacking in attendance this year, particularly over the weekend. Yet, for those of us in the manufacturing realm, there was a higher concentration of influential buyers and key contacts among those who did attend. So in that case, the show boasted more quality contacts over quantity of contacts, at least for us. 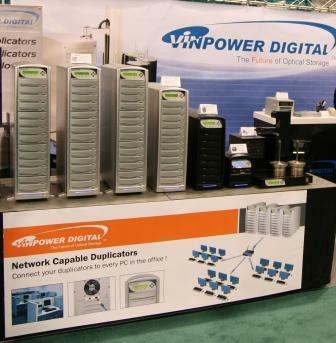 In addition to our showcase of standalone CD/DVD, Blu-ray and LightScribe capable duplicators from the Vinpower Digital line as well as the exceptional Xerox Disc Duplicators with the PC connect â€œDrag & Dropâ€ feature, we displayed some new products for 2009. One of the products was the TITAN lite LightScribe standalone autoloader with the only automated flipping mechanism which allows the unit to become a fully automated LS publishing system! This system can operate as a standard standalone CD/DVD duplicator with LightScribe printing capabilities in 100 or 200 disc capacity or as a complete automated copy and LS print station with 100 disc capacity. Another new product unique to Vinpower Digital on display was our new Network Capable towers. These systems can be connected to an internal network using standard LAN/Ethernet connections so that an entire office has the benefit of sending their image files and/or LightScribe print files to the duplicator. 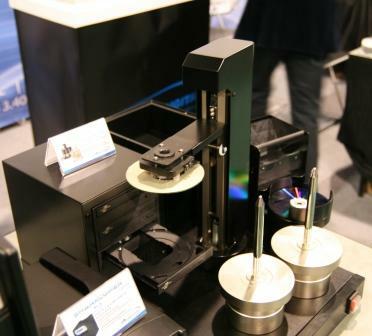 Plus we showcased our line of Blu-ray duplicators as well as Blu-ray media which is becoming a much bigger player in the duplication market now that the pricing is more reasonable and the format has been adopted by a wider consumer market. We also exhibited our full range of SATA and IDE/PATA controllers for manual tower or robotic autoloader duplicators. Overall it was a successful show and we look forward to a renewed and more densely populated with quality attendees, CES 2010.